Providing citizens with a safe, healthy and attractive work and home environment. A structure is considered substandard when it does not meet the standards or specifications established in the International Property Maintenance Code. 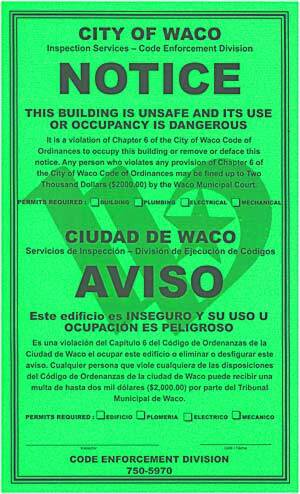 The International Property Maintenance Code enables the City of Waco to require repair, maintenance or demolition of structures that may endanger the life, health and safety of occupants or the public. This code requires owners to maintain their structures and to prevent infestation of insects and rodents. The City of Waco inspectors are pro-active as well as reactive to the complaints generated from citizens, police department, fire department, health department or other sources. The City of Waco systematically inspects structures used for commercial or industrial purposes. If such buildings are found unsafe, then the property owner will be required in writing to bring the property into compliance. There are three levels of substandard structures. This is the lowest level of code enforcement. Items often addressed are minor including peeling paint, missing window and door screens and rotted wood. Required repairs are sometimes more extensive such as the repair of a leaking roof or foundation failure. The 60-day program allows the owner/occupant to occupy the structure while repairs are being made. This is the intermediate level of code enforcement which declares a structure repairable but prohibits occupancy. In this condition, the structure should be vacated and repairs made. A structure is unfit for human occupancy whenever the code official or his/her agent finds that the structure is unsafe, unlawful or, because of the degree to which the structure is in disrepair or lacks maintenance, is unsanitary, vermin infested, contains filth and contamination or, lacks ventilation, illumination, sanitary or heating facilities or other essential equipment required to the code, or because the location of the structure constitutes a hazard to the occupants of the structure or to the the public. These structures are considered repairable. The owner will be given notice of a hearing and must attend a meeting of the Building Standards Commission to discuss time schedules concerning the repair of the structure and civil penalties if repairs are not completed within a specified time frame. This is the highest form of code enforcement. The requirements are the same as above but the structure is considered infeasible to repair and is required to be demolished due to the degree to which the structure is in disrepair. The owner will be given notice of a hearing and must attend a meeting of the Building Standards Commission. At this meeting the owner may request that the recommendation of the Code Enforcement Division to be overturned and that the structure may be repaired. If it is the decision of the Building Standards Commission that the structure is demolished a time schedule will be given and the owner allowed time to demolish the structure and clear the lot of debris. If the Commission does not accept the Inspection staffs recommendation and converts the structure to green tag status, the structure will be handled as a green tag (described above). The City of Waco follows guidelines set forth by state law concerning Junked Motor Vehicles. Junked Motor Vehicles that are visible from a public place or public right-of-way are detrimental to the safety and welfare of the general public, tend to reduce the value of private property, invite vandalism, create fire hazards and harm the economic welfare of the city. By definition a Junked Motor Vehicle is one that displays an expired license plate or does not display a license plate, and is wrecked, dismantled or partially dismantled, or discarded, or has remained inoperable for more than 30 consecutive days. This provision does not include vehicles that are completely enclosed in a garage or storage building intended for motor vehicle storage, placing a tarp or car cover on a vehicle does not constitute proper storage. Residents are given written notice to remove or store such vehicles within 10 days or face legal action as well as towing and possible demolition of the Junked Motor Vehicle. The following test is used to determine if the vehicle meets the criteria of a Junked Motor Vehicle. Is the vehicle self propelled? If no, the vehicle is not a junked motor vehicle. Are the license plates on the vehicle current? If yes, the vehicle is not a junked motor vehicle. Is the vehicle visible from a public place or public right-of-way? If no, this is not a junked motor vehicle. We also ask the following questions. Is the vehicle wrecked, dismantled, partially dismantled, or discarded? Is the vehicle inoperable and has remained inoperable for more than 30 consecutive days on private property? Is the vehicle inoperable and has remained inoperable for more than 72 consecutive hours on public property? If the answer to any of the above questions is yes, then the vehicle is considered a junked motor vehicle and residents will be given 10 days to restore or remove the vehicle. For vehicles located in the public right-of-way or on public property, contact the Waco Police Department at (254) 750-7500. Section 16-96 of the City of Waco Code of Ordinances simply states that "No person may throw or deposit litter or junk on occupied, unoccupied or vacant privately owned property within the city." "No person may accumulate or allow to accumulate litter, junk, rubbish or garbage on occupied, unoccupied or vacant privately owned property within the city." Litter shall mean garbage, refuse and rubbish and all other waste material which, if thrown or deposited as prohibited in this article, tend to create a danger to public health, safety and welfare. Junk shall mean all worn-out, worthless and discarded material, including odds and ends, old iron or other metal, glass and cordage. It shall be unlawful for the owner or occupant of a residential building, structure, or property to utilize the premises of such residential property for the open storage of the following items, including but not limited to, ice box, refrigerator, stove, glass, carpet, upholstered furniture, tires, auto parts, building rubbish or other similar items. It shall be the duty and responsibility of every such owner or occupant to keep the premises of such residential property clean and in compliance with this section. Illegal dumping harms the environment and creates a danger to public health and safety. Violators caught illegally dumping trash and debris are ticketed immediately. Residents are asked to record license plate numbers of illegal dumpers and to report the incident to Waco Central immediately, making it easier for police to catch the culprit. To report Illegal Dumping, call (254) 299-CITY (2489). Residents can properly dispose of any items at the Cobbs Convenience Center, 44th and Cobbs Drive, (254) 751-8536. Also the City of Waco regularly sponsors a Household Hazardous Collection Day once a year. High weeds and grass can become a fire hazard, as well as a breeding place for mosquitoes and rodents. Grass or weeds higher than 12 inches are not in compliance with the City of Waco's ordinances. Owners of properties in violation of the grass and weeds ordinance will receive a notice allowing 7 days to bring the property into compliance. If the property is occupied and the problem is not resolved, the owner will be issued a ticket. Legal action could be taken in Municipal Court. If the property is vacant the City may send a contractor to mow the high grass and weeds, and issue a bill consisting of mowing fees and administrative service fees to the property owner. In the interest of public health and safety, any property with high grass and weeds that has grown higher than 48"inches can be cleaned or mowed without prior notification to the owner. The City will send a bill for this service to the property owner. A lien will be placed against the property for any bill not paid within 30 days. If you need assistance with mowing and property clean-up, a list of mowing contractors is available to download.